Chef Paul Gayler is one of the food industry’s gems. He is a well respected man with years of worthy career behind him. He is executive chef at London’s celebrated Lanesborough Hotel and has a shelf of cookbooks to his credit. This Great Homemade Soups – A Cook’s Collection is the latest one and it does him proud. Paul Gayler writes cookbooks, yes, but they are a step beyond most of that genre. Paul encourages, inspires and tutors. There are more than 100 soup recipes here and they all have an introduction from Paul to put them into culinary context. Paul reminds us that soup is a cornerstone of many cuisines and is enjoying something of a revival. 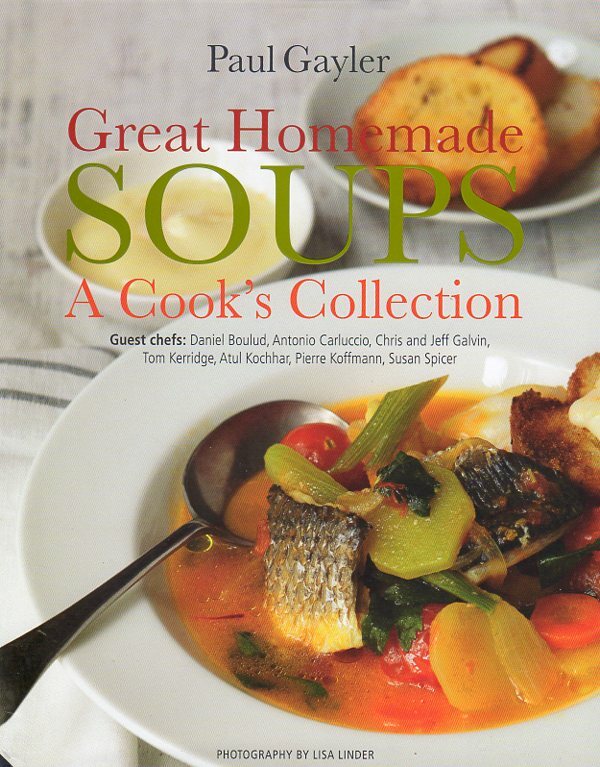 Great Homemade Soups – A Cook’s Collection works on several levels. It offers some economic and hearty fare that won’t break the bank – comfort food for the whole family. Paul also suggests sophisticated bowls of luxurious ingredients destined for appreciative dinner-party guests. There is an array of soups from across the globe to tempt those with a hankering for the exotic. This book is a veritable Masterclass for all things soupy. Sweetcorn soup with scallops and crispy bacon bits is simple to make but has great impact. Anything with scallops is bound to get attention and approval. It’s that combination of crispy and meltingly tender, of salty and sweet, that is always appreciated. Carrot soup with seven spices is a blessing on cold winter evenings when one is listening to the wind blowing and the pipes bursting. Granted there is that list of spices but anyone who has cooked Indian food at home will likely already have those to hand; and carrots, at the time of writing this article, were still affordable. This is a recipe with which to start a subcontinental meal, but just add a chunk of crusty bread and one can call it supper or lunch. Potato and leek soup is another comforting and silky dish that showcases simple and common ingredients. I think, though, that this traditional preparation works with Sunday lunch, mid-week dinner, or as a sustaining winter snack. The cream gives it a luxurious quality and is key to the success of the soup. My pick-of-the-book is Crab Laksa. This soup is becoming more popular as tourism to Malaysia has increased. It’s a dish that changes by region but Paul Gayler presents us with a version that gives the authentic character of this national treasure. It’s a meal in itself if one serves it in a large Chinese bowl. It needs no additional garnishes, and each of the ingredients brings texture or flavour to the finished dish. It’s vibrant and exotic. Paul’s charming personality shines through in this volume. One has the sense of a conversation over the kitchen table. One feels supported by a chef whose recipes we can trust. This is a sensible book that one would actually use, and that surely is the best accolade one could give. A gift-quality volume at a very reasonable price.